More than 20 projects in 3 counties, come join us! Stella's Open Pantry is held on the fourth Saturday of every month, helping more than 40 local families get much needed food (tons of canned goods, boxes and bags of food, as well as vouchers for milk, eggs, and bread). Food collection at Valley Market on the first Friday of each month. Collection boxes are in strategic business locations within Colorado City and Rye, at the Bank of the San Juans, Valley Market and Greenhorn Valley Library. Food is also donated by Loaf and Jug, Saint Aloysius Church, Rye Home United Methodist Church, the Rye Women's Club, and generous VFC members. Walsenburg food collection is at First Choice Market on the second Friday of each month. Our La Veta food collection occurs on the third Friday of each month at Charlie’s Market, in cooperation with local churches. Food is given to Dorcas Circle to distribute to the community. We recycle cardboard behind Valley Market on the second Saturday of each month from 9:00 a.m. to 10:30 a.m. We do not charge for this service. VFC provides our volunteers with $40 to spend per child each holiday season for gifts for local families in Huerfano, Custer and Pueblo counties. Our shopping "elves" meet for our annual potluck and wrapping gathering, which is always a lot of fun! In 2009 (our 1st year) we delivered gifts to 14 children. In 2015, we spent $8,500 on 216 children! Gifts are not only toys, but necessary items such as winter clothing and supplies needed for school. Our goal is to continue to grow as an organization and build bonds with the community. 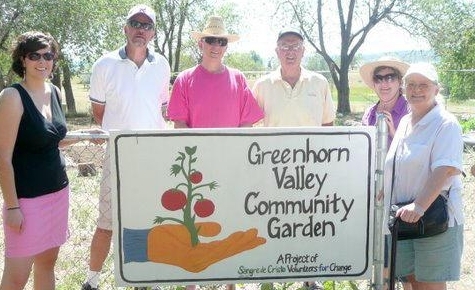 We sponsor and support the Greenhorn Valley Community Garden in Colorado City. During spring, summer and fall, have your very own raised bed garden! Fellow gardeners will water for you when you are gone and there's no way to learn the tricks of the trade better than by gardening with others. These group members enjoy needlework, and make caps and scarves for our holiday gift distribution, and lap robes and scarves for veterans. Knitters and crocheters in Pueblo and Huerfano counties meet on the 4th Thursday of each month. In Gardner, we have a group for children learning to knit and crochet called KidsKnit led by members who are former teachers. We clean highways in three counties: Interstate 25 near Exit 74, at the Huerfano Butte near Exit 60, and in Custer County on Highway 69. VFC hosts an annual Easter Egg Hunt the Saturday before Easter weekend. The festivities are open to the community taking place in Greenhorn Meadows Park. Kids can hunt for Easter eggs, participate in face painting, egg painting, ride goat-carts, and more! We just wrapped up our 8th annual yard sale. The annual yard sale is scheduled over a weekend late in the summer. Each of our sales have been more successful than the one before. This is our major fundraiser. Contact us to donate items; some items we cannot accept. We help teachers in the classroom at Rye Elementary and Gardner Elementary. In addition, we help support school trips, school activities, donate such things as iPads, winter clothing, backpacks with supplies, and furnish materials for students with special needs. We sponsor group visits to Mission:Wolf as well as help schools offset cost of field trips to this wolf sanctuary. This is a fun day trip for all ages!